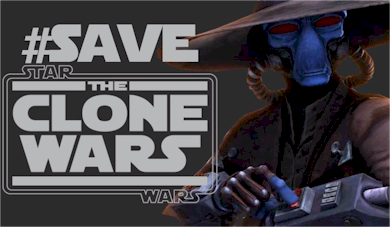 Save The Clone Wars: Was Clone Wars Intended for 8 Seasons? Was Clone Wars Intended for 8 Seasons? We want more than bonus content. We want the natural conclusion of The Clone Wars as envisioned by George Lucas, Dave Flioni and the writers for the series. According to two recent articles "STAR WARS: James Arnold Taylor and Cat Taber Discuss the End of The Clone Wars" from Big Shiny Robot and "The 'End' of the Clone Wars Series Has Been Revealed" from Star Wars Underworld, Star Wars: The Clone Wars was intended to have 8 seasons and transition to Episode III. "James and Cat talked about what the plan for The Clone Wars was (8 seasons! ), what they would have liked to see happen with the final seasons (ABCs next to Once Upon a Time!) and what their experience with the show over the course of their career has been like." Source: Big Shiny Robot. The full interview will Full of Sith Podcast can be found here. Around 3:45 into podcast episode, James Arnold Taylor begins sharing that the cast thought that the series would continue for about 8 seasons, and that he thinks most of the work has been completed for season 6. "This exchange [tweets from Freidman] has fueled much speculation among fans about when the series will end, with some suggesting that Seasons 6 or 7 may be the final one. However there are a few reasons to believe that the Clone Wars will not conclude anytime soon." The StarWarsUnderworld.com article also gleans some information from an interview that Jimmy Mac had with Christian Taylor, writer of the epic Mortis trilogy for Star Wars: The Clone Wars, at the season four premiere which was posted to YouTube on September 11, 2011. "...writer Christian Taylor stated that, "We are 3 years ahead of you guys. We've already written season 6." It logically follows then that Season 8 is already in early writing stages." Source: Star Wars Underworld. The full video of the interview is posted below. Thanks to Clonewarsfan1 who brought these two articles to our attention.